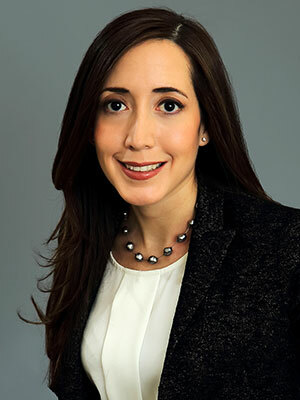 Paula Lopez joined Allyn & Fortuna LLP in 2005 and became a partner of the firm in 2013. She focuses her practice on employment law, complex civil litigation matters and administrative and regulatory law. While at Allyn & Fortuna, Ms. Lopez has litigated and advised clients on a variety of legal issues ranging from employment disputes, corporate governance, corporate disputes, and the arbitrability of disputes. Ms. Lopez’s litigation experience includes serving as trial and appellate counsel in federal and state courts. As a result of her extensive experience and superior skills in researching, writing and analyzing intricate legal issues, Ms. Lopez has a stellar record of formulating successful litigation strategies on behalf of the firm’s clients. She has defeated claims and avoided the delays and expense of lengthy trials through the submission of written motions and briefs. Ms. Lopez counsels clients on various employment and compliance issues, ranging from social media to anti-discrimination policies, hiring and firing practices, workplace safety issues, wage and hour compliance, and other employment related matters, with the intent to ensure our clients’ compliance with constantly evolving employment laws and to prevent future claims. However, when a client finds itself having to defend against employment-related claims, whether filed in court or with city, state or federal administrative agencies, Ms. Lopez stands ready to effectively represent our clients in defending against such claims. She also represents clients ranging from national drug store chains, national restaurant chains and national home improvement chains on a variety of legal/compliance matters consisting of federal, state and local environmental, health, fire safety, occupational safety, consumer protection, promotional and advertising matters. Ms. Lopez has successfully defended these clients in all types of criminal and administrative proceedings, including those affecting their businesses’ licenses and permits. The firm’s clients have also benefitted from the relationships she has fostered with state and local enforcement agencies in avoiding the escalation of non-compliance issues and heading off enforcement actions. Ms. Lopez was born in Quito, Ecuador and is fluent in Spanish. She received her Bachelor of Arts from Rutgers College, Rutgers,The State University in 2000 and her Juris Doctor in 2003 from Tulane University Law School, where she served as Managing Editor of the Tulane Law Journal of American Arbitration and received the CALI Award for Venture Capital. Professional Activities: Ms. Lopez is a member of the New York City Bar Association, New York State Bar Association and New York County Lawyer’s Association. She is also a member of the New York City Bar’s Labor and Employment Committee. She has designed and given presentations on Developing and Implementing Social Media Policies in Compliance with the NLRB to trade groups. Recent Publications: Nicholas Fortuna & Paula Lopez, Overtime Pay – Claims by Store Managers and Assistant Managers on the Rise, Chain Store Age, (November 2014 On-line edition, December 2014 Print edition). Nicholas Fortuna & Paula Lopez, Managing Litigation Costs, Inside Counsel (December 2014). Media Coverage: Interviewed and quoted in a variety of local and national media stories appearing in national newspapers, such as The New York Times, U.S.A. Today, The Washington Post, US1 + PrincetonInfo.com, as well as in digital media (The Fiscal Times and AccountingWEB). Other Activities: Ms. Lopez is a contributing writer to the firm’s on-line bulletin on employment law and emerging legal issues, www.allynfortuna.com.